New in stock this week are five more beautiful 1:43 scale diecast replica models by Spark. 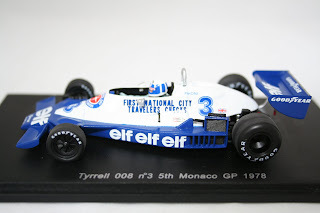 Now available is this stunning Tyrrell 008 F1 car as driven by Didier Pironi to 5th place in the 1978 Monaco Grand Prix. 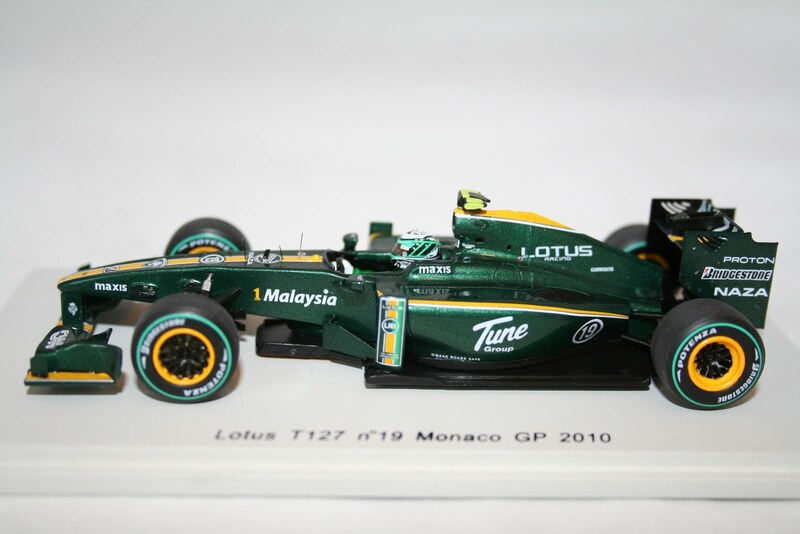 Also new in stock this week is the 2010 Lotus T127 as driven by Jarno Trulli, a Leyton House March driven by Paul Belmondo in 1992 and Jo Siffert's 1971 Austrian GP Winning BRM. Away from F1 we have the latest 2010 Le Mans release available, being a BMW M3 as driven by Muller, Farfus and Alzen. For full details and prices on all these models please visit our store below. Now in stock is the latest of the 2010 F1 Grid to be produced by Spark Models. 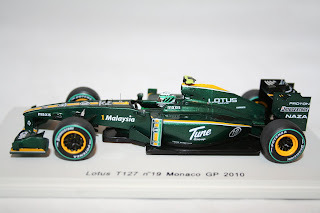 This stunning 1:43 scale Lotus 127 as driven by Heikki Kovalainen in the 2010 F1 Season is now available to order. Also back in stock this week are the two Virgin VR-01 F1 cars from last season. New from Minichamps this week is James Toselands Yamaha YZR M1 from 2009 and Mika Hakkinen's 1998 Championship wining McLaren MP4/13. Finally new for this week is the latest model from Trofeu, a Ford Sierra Cosworth BTCC Car as driven to victory by Win Percy at Silverstone in 1987. For details on all these new releases please visit our store below. 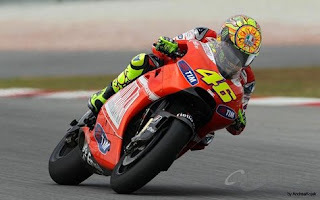 With the start of the new Moto GP season only a few days away Hart Motorsport are pleased to announce that Minichamps will be releasing a range of Valentino Rossi Ducati Models. Due towards the end of the year Minichamps will be producing three 1:12 scale Bikes plus two 1:12 scale figures. Announced so far are two black Ducati Test bikes and one rider figure from the winter test at Valencia in 2010 plus a 2011 Launch bike and figure. We are sure the combination of Rossi and Ducati will make these models one of the fastest selling replicas of the year. For pre orders or any further information please don't hesitate to contact us. 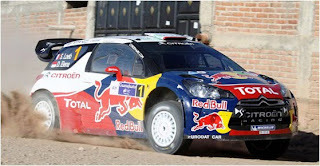 Spark models have just announced four new Citroen DS3 Rally Car replicas are due for releases in May 2011. All models are from the early rounds of the 2011 World Championship and with all Spark models the detail will be second to none. Coming soon will be the following versions of the Citroen DS3 model. For further details or pre orders please don't hesitate to contact us via our store below. New in stock this week is the stunning Yamaha YZR M1 GP bike as ridden by Colin Edwards in the 2009 Moto GP Championship. Built by Minichamps the model has the usuall removable engine covers to reveal great detail as well has having rolling rubber tyres, turning front wheel and paddock stand. Also new in stock this week are three new Jean Alesi diecast replica's by Hotwheels. All 1:43 in scale the models are versions of his Ferrari F1 cars from the 1992, 94 and 95 F1 seasons. New from Spark this week is a BRM P160B from 1972 and also a Lotus 56 as driven at the Indy 500 in 1968. Finally Minichamps have released two more stunning Limited Edition Audi R8 race cars from 2010. For details on all these models plus many more please visit our store below.